“The NSB share deal became a big crisis in the country. It was newspaper headlines every day. So I summoned the relevant people and got them to return the money and cancel the transaction. 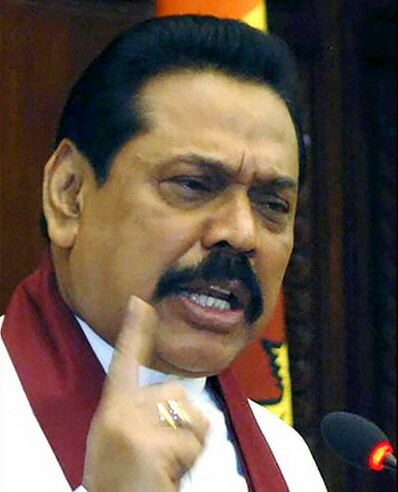 We quietly covered it up, that is how it should be done after all, he is our man (ape miniha),” President Mahinda Rajapaksa said yesterday. Speaking at the opening of the Chartered Accountants of Sri Lanka building in Colombo President Rajapaksa said that it was the UNP that first spoke of an impeachment motion against the Chief Justice after the NSB transaction, he said. “This is the Chairman we appointed. This is the Chief Justice we appointed,” he said. At the same event, the President said that he would appoint an independent committee to review the PSC report on the impeachment of the Chief Justice, in order to ‘satisfy his conscience’. Following is the full speech by the President. It’s An Evil World And We Need Strict Rules! THIS IS TRUE TO THE WORD. Rohan on Easter Sunday Bombing: A Sense Of Belonging Must Be CreatedThere is no sense of belonging created for the island’s Tamils yet.